How can we show our appreciation for the affordable style in Penneys while also contributing to charity services supporting children? 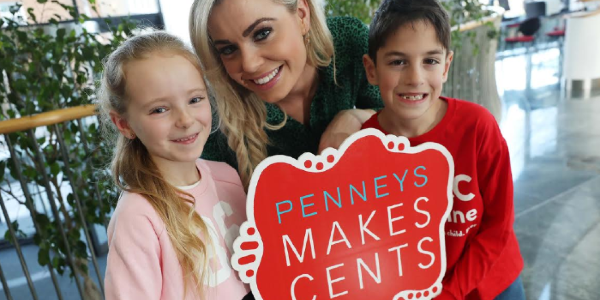 The ISPCC Childline have joined forces with our fave retailer for the Penneys Makes Cents campaign. All Ireland-winning camogie star Anna Geary has teamed up with the partnership which aims to make it easier for Penneys customers to support children and young people across Ireland. From February 17 to 24, Penneys Makes Cents will give it's customers a chance to ‘Add a little. Do a lot’ for the nation's listening service for kids. Children and young people make over 380,000 calls, texts and online contacts every single year to Childline's free phone line, live text and web chat services. These kids seek a listening ear and feel as though they have nowhere else to turn when they make the call; they are experiencing trauma, abuse, neglect, fear and loneliness and vitally need help. No child should have to live through this. “I am delighted to support this fantastic partnership between ISPCC Childline and Penneys. With the support of Penneys and its customers, the vital Childline service will be there for every child and young person in Ireland at every hour of every day and night in 2019 and beyond." To help keep Childline listening to children and young people, head down to Penneys between February 17 and 23 to donate 50 cent or more to ISPCC Childline. Even a little amount goes a long way. Ireland’s only 24‐hour listening service for children desperately needs your help when purchasing your Penneys items, and the ISPCC’s Childline service will receive 100 percent of all donations raised in the campaign.